Militia units from surrounding towns faced the angry crowd. The militia captain demanded, “Who is your leader?” The entire crowd shouted, “I’m the leader!” This confrontation might bring to mind a famous scene from the 1960 film Spartacus. But it actually took place on March 7, 1799 in Easton, PA., during what is known as the Fries Rebellion. The Fries Rebellion was one of many, like the Shay’s and the Whiskey Rebellions, that immediately followed the Revolutionary War. These uprisings rose from tensions between Revolutionary ideals of egalitarian self-determination, and problems of nation building with a centralized power structure. In post-Revolutionary terms: (egalitarian) Republicanism vs. (centralized) Federalism. The Fries Rebellion occurred in German communities of Pennsylvania’s Northampton, Montgomery, and Bucks counties. German immigrants had been near the bottom of the social ladder since establishing themselves in the area several decades earlier. They were drawn to the fringes of colonial society by the allure of freedom from impoverished servitude back home. Pennsylvanian Anglicans and Quakers, however, considered them ignorant, lawless, and alien. Along came the Revolutionary War and it’s egalitarian promise. Here was a chance to socially advance by joining the cause, enlisting in the Continental Army, and proving themselves as patriotic – and equal – citizens. The Fries Rebellion, like Spartacus’ slave revolt, was quickly put down. Unlike Spartacus, who was nailed to a pole by the Roman army, the Fries Rebellion’s nominal Republican leader John Fries (the whole point was that there should be no ‘leaders’) got a presidential pardon by Federalist John Adams. Furthermore, the status of German communities continued to grow. As Germans fought to secure a place in the new order, they began proudly displaying their ‘German-ness’ for all to see through quilting, illuminated manuscripts, furniture, and other decorative arts. This was the heady environment that witnessed the flowering of Pennsylvania sgraffito redware pottery, or “Tulip Ware” as it has become affectionately known. Yes, Tulip Ware is flowery, ornate, and pretty. It also denotes pride and determination in the face of discrimination and disrespect. There was no need for individual leaders in that effort, either. Many Identities, One Nation, The Revolution and It’s Legacy in the Mid-Atlantic. Liam Riordan. University of Pennsylvania Press/Philadelphia. 2007. “…a small brown jug bears his name, in slightly uneven letters, W. Fives.” – M. Lelyn Branin. In 1834, scions of Whately MA pottery families Orcutt and Crafts began a shop ultimately known as the Portland Stoneware Company of Portland, ME. They churned out huge amounts of ware, mostly 1 to 4 gallon jugs. Orcutt dropped out in 1837. Caleb Crafts took William Fives as a partner. Their partnership ended a few years later. Caleb left town. William stayed on, but never again as owner. He rented an apartment on Green Street with several fellow potters. William eventually married, bought a house and had children. He quietly passed away on Dec 5, 1849. In the words of genealogist Susan Hoffman, William Fives “led a very quiet life.” Normally, that would be commendable – though somewhat dull. In William’s case “quiet” was amazing. His family had emigrated from Ireland in 1803. William was Irish in the mid 19th century northeastern United States. The Irish were roundly despised even before a mid century deluge of ragged Irish immigrants broke on these shores. They were considered even lower than the black population at the time. After all, white folk ‘knew’ the blacks. Blacks spoke the same language, had the same religious beliefs, ate the same foods and, while often poor, they did not generally live in abject squalor. Gaelic speaking Irish arrived with absolutely nothing. They were starving, stinky, sickly and destitute. They tended to radicalism due to past experience. Worst of all, they were papists! Catholic! The Irish didn’t become ‘white’ until well after the Civil War. William Five’s Green Street apartment seemed to be a focal point for Portland Stoneware Company potters. Their surnames suggest an eclectic work environment. Clough (Welsh), Aliff (Breton), Vankleek (Dutch). ‘Melting pot’ potteries might not have been rare, although it is known that some – the Norton’s of Bennington most notably – strictly favored local boys. The Portland roster indicated a fairly open-minded environment in the midst of wide spread xenophobia and anti-Irish sentiment. Open minds are to be treasured even in the best of times. For that alone William Fives and his cohorts deserve notice. The Early Potters and Potteries of Maine. M. Lelyn Branin. Wesleyan University Press/Middletown Ct. 1978. Early New England Potters and Their Wares. Lura Woodside Watkins. Harvard University Press/Cambridge MA. 1968. How the Irish Became White. Noel Ignatiev. Routledge/New York, London. 1995. “War is hell.” – William Tecumseh Sherman. Automobiles excited speed freaks from the beginning. But Prohibition bumped things up a notch. Young men raced bootleg whiskey to backwoods delivery points. When Prohibition ended the drivers didn’t want to stop. One thing led to another and racing became a “sport.” They raced each other for small stakes. Once money got involved it became NASCAR. The whiskey those early daredevils drove around came in salt-fired stoneware jugs. This scenario was officially sanctioned a few brief decades before, with far reaching consequences for everyone involved. The Civil War had ravished farms across the South. Barns were burned and cattle herds were decimated. Reconstruction efforts like the 1870’s Farm Alliance Program promoted corn production as a cash crop for whiskey distillation. There simply wasn’t much livestock to feed. Whiskey boomed. So did the need for jugs to put it in. One immediate consequence was that local potters couldn’t keep up with demand. Quality predictably declined when so many newcomers flooded the market. Many of these new potters were itinerants. The very best were called “500 gallon men” due to the quantity they could produce in a day. But many others were just “whiskey heads” who breezed into shops, made a few bucks, blew it all on whiskey, and drifted off again. The stoneware whiskey jug boom also impelled several important technical innovations. Albany slip came into common use, sealing somewhat porous jugs and protecting their precious contents. As production grew, kilns evolved. Some potters stayed true to their old groundhog kilns but others needed more stacking space and more consistent firing. Kilns got shorter, taller and more fuel efficient. After Prohibition, visitors from cities like Atlanta and Athens sought out rustic ceramic ‘tourist items.’ The stage was set for Jugtown and all that followed. Meanwhile the young bootlegging drivers sped off to their own destiny. OK, so it can’t be said that pottery alone created NASCAR. But pottery was a crucial ingredient there at the beginning. Raised in Clay, The Southern Pottery Tradition (1984). Sweezy, Nancy. Smithsonian Institution Press/Washington DC. Turners and Burners. Charles Zug. University of North Carolina Press/Chapel Hill, NC. 1986. There was a conversation between two 19th century redware potters that never actually happened. Their little ‘chat’ was just a letter to a friend and a newspaper ad written in two different states several decades apart. What potter has not at one time or another teetered into the depths of the chasm exposed between these two sentiments? American Redware. William Ketchum Jr. Holt & Co./Ney York. 1991. Dirk Claesen truly was good. He soon married and bought property. His “potbaker’s corner” plot was the city’s redware production focal point for the next 150 years. In 1657 Dirk became the first of only four “pottmakers” to receive New Amsterdam Burgher Rights. His pottery skills served him well. But things went bad. Dirk remarried twice. Legal problems hounded him and his three wives. In 1655 Wife #1 sued a man for hitting her. She sued another for stealing her canoe. Dirk sued Andries Hoppen to pay for pots Hoppen ordered. In 1665 Dirk sued Anthony Dirkzen for taking salary as an employee then running off “to fight indians.” In 1670 Dirk sued to get paid for a brick carrying job. In 1673 Wife #2 was sued to pay for two beaver pelts. What’s missing in this messy tale is any description of Dirk Claesen’s pottery. He was, after all, “extraordinary” at it. The moral of the story? Pots come and pots go, but your rap sheet lasts forever. Why did men used to need a dowry bribe to marry? Fortunately, these enlightened days offer men an alternative prenuptial pageant. And women get bridal showers, so goods are still exchanged. In the early 19th century a working class bride might instead expect to receive an “outset,” a collection of useful items given by her parents on occasion of her marriage. People needed many things to start up a household. Silverware. Bedding. Furniture. And pottery. Especially inexpensive redware slip trailed with moralistic adages. Chamber pots were a common gift. Various kinds of dishes were another. These were occasions when the parent (or the potter) could have some fun. “When this you see remember me…” Or offer words of advice. “Give drink to the thirsty.” Or instruct in proper living. 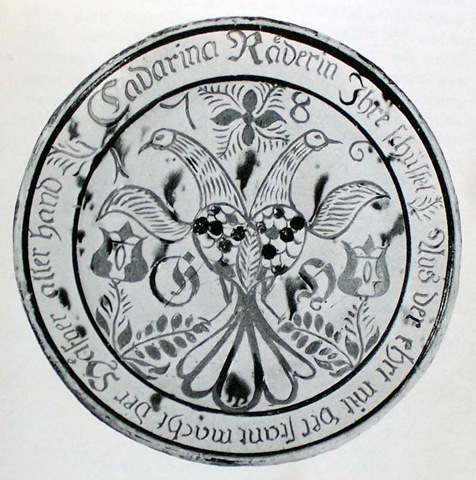 “Visit the sick.” Sgraffito potters also got in on the act with whole sentences scrawled around plate rims. “Eating is for existence and life, drinking is also good besides.” Words to live by. But one wonders at some sayings trailed onto outset gift plates. Take, for example, the bacon plate shown below. “Hard times in Jersey.” The two most likely makers of this plate were either Henry Van Saun who ran a “Pottery Bake Shoppe” near New Milford, NJ from 1811 to 1829, or George Wolfkiel who bought the old Van Saun shop in 1847 and ran it until 1867. Wolfkiel is believed to have made a set of dishes for the wedding of a certain Mrs. Zabriskie in nearby Ramsey. It’s possible that this plate was part of her outset. You can see this bacon plate today at the Wadsworth Atheneum in Hartford CT. But what was the message to young Mrs. Zabriskie on the occasion? Good luck? Oh well? Told you so? The Reshaping of Everyday Life. John Worrel. Harper Perennial/New York. 1989. Kitchen Ceramics. Selsin, Rozensztroch, and Cliff. Abbeville Press/New York. 1997. Everybody loves an underdog, as the saying goes. But whenever a rural occupation confronts an industrial revolution, doom results. In this regard, early American redware potters were singularly marked. They might marry the tavern keeper’s daughter (lots of business was transacted in taverns) or open a dry goods store (another reliable outlet) to avoid their fate. Some switched to stoneware. Some quit altogether. Others found salvation in flowerpots. Abraham Hews of Weston MA wasn’t thinking this when he opened a redware shop in 1765. He relied on ‘word-of-mouth’ sales within walking distance of Weston instead of the huge nearby Boston market. Still, probate records at his death put him solidly in the middle income bracket. In fact his was to be one of the few redware potteries to remain active, from father to son, until 1871. Abraham Hews II had big plans for the shop. He actually listed himself in tax roles as “potter” (Abraham I only ever called himself “yeoman”). Things went well, even though Abraham II phased out extraneous slip decoration after 1800 like most New England redware potters would. But the writing was on the wall by the 1860’s. The Hews family began the switch to flowerpots, both molded and hand made, to stay alive. They relocated next to clay pits shared by North Cambridge MA brick makers in 1871. The Panic of 1893 erased North Cambridge’s brick industry, leaving all that clay to A.C. Hews & Co. So perhaps it’s no surprise that at the dawn of the 20th century Hews could boast an output of over 20 million flowerpots. More than anyone. Anywhere. Ever. Plastics finally slew the Hews clay flowerpot business in the 1960’s. One family’s 200 year involvement in clay ended. It might date me, but it’s a personal thrill to think that one small slice of redware pottery history saw it’s closing chapter in my own lifetime. It’s nice to feel connected. Domestic Pottery of the Northeastern United States, 1625-1850. Sarah Peabody Turnbaugh, Ed. Academic Press/New York. 1985. The Reshaping of Everyday Life: 1790-1840. Jack Larkin. Harper Perennial/New York. 1989. Enigmas, or inside jokes, defined late 18th – early 19th century Bucks and Montgomery County PA Germanic “tulip wares.” Flowers, people and animals that no sane person could ever tire of looking at were paired with commentary (maybe or maybe not arcanely reflecting religious sentiments) around the rim. A plate with a beautiful peacock surrounded by vined flowers by Georg Hübener (active 1785 – 1798) read, “Surely no hawk will seize this bird because the tulips bend over it. The kraut is well pickled but badly greased, Master Cook.” Other oddities included “I am very much afraid my naughty daughter will get no man” (Henry Roudebuth, 1813). “Early in the morning I fry a sausage in sour gravy” (Michael Scholl, c.1811). “To consume everything in gluttony and intemperance before my end makes a just testament” (Jacob Scholl). German emigration beginning in the 1680’s brought a well developed sgraffito style with copper green highlights (unlike English counterparts) to the area. But the late 18th century uniquely American development of the fruit pie caused an explosion in decorated dishes. Dishes by Johannes Neesz (sometimes spelled Nase, or Nesz, as on his 1867 gravestone) stood out. He experimented with black backgrounds for his sgraffito. He combined sgraffito with colored slips. More importantly, he carried sgraffito beyond just pie plates and onto all sorts of thrown works, from tea sets to pickle jars, shaving basins, and more. Others previously had dallied with this. Others since would go further. But Johannes purposefully pushed the boundaries of what was possible in tulip ware. Tulip Ware of the Pennsylvania-German Potters. Edward Atlee Barber. Dover Publications/New York. 1926. Lead Glazed Pottery. Edwin Atlee Barber. Museum of Philadelphia/Philadelphia. 1907. Cheesequake potters were lucky. The little village lay next to a massive deposit of excellent stoneware clay in the Amboy region of New Jersey. The Morgan family in Cheesequake owned the deposit. 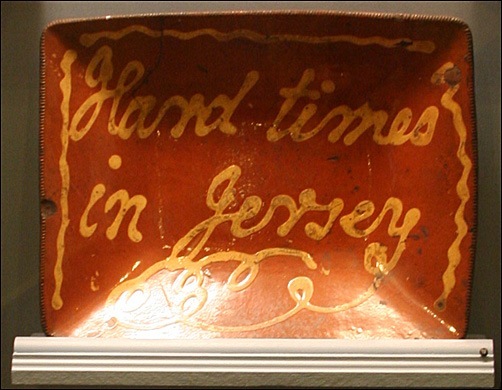 These master potters, along with their allies the Warne and Letts families, dominated Jersey markets during the late Colonial era. So the New York Crolius/Remmey’s were dependent on the New Jersey Morgans. Maybe their relationship was amicable. But why was William Crolius lurking about on 1786-90 Amboy NJ tax roles? Poking around for an exposed seam off of Morgan’s property? The British, ever aware of the value of a good pot shop, sent a raiding party on August 8, 1777, to ransack Continental Captain (later General) James Morgan’s stoneware shop during the Revolutionary War. John Crolius lost his pottery to the Red Coats a year earlier due to his patriot proclivities. After the war, thanks to canals and (eventually) railroads, Morgan’s clay almost single handedly supplied the 19th century avalanche that became The Age of American Stoneware. The Remmey/Crolius clan withered on it’s lofty perch in Manhattan. But the Crolius/Remmeys seem to have not given up easily. Joseph Henry Remmey owned the Morgan pottery for a time in 1820. In 1822 Catherine Bowne, James Morgan’s granddaughter, obtained the shop and ran it until 1835. Clay supply success eventually eclipsed the Morgan’s own pottery business. Potters everywhere now worked with their clay. About all that remains of the Morgan, Werne and Letts potteries, the Crolius and Remmey potteries, and the Amboy pits themselves is archeological interest. You can still study mute examples of this fabled material – thrown, fired and salted – in museums and Historical Societies. But if you took a Morgan jug out from a glass case today and put it’s mouth to your ear, like a sea shell, maybe you could hear the battles that once raged over those clay pits. Ceramics in America. Ian Quimby, Ed. University Press of Virginia/Charlottesville. 1972. Decorated Stoneware Pottery of North America. Donald Webster. Charles Tuttle Co./Rutland Vt. 1971. Early American Pottery and China. John Spargo. The Century Co./NY. 1926. American Stoneware. William Ketchum. Holt & Co./New York. 1991. –Earl Butz, Secretary of Agriculture, Nixon Administration. They say potters make good cooks. Some do. More to the point, for ages having things to put things in was crucial to subsistence survival. (Not that anything’s changed, we just don’t think about it as such). Obviously diet dictates the containers we need for processing, storing and eating food. Just as obviously potters across the globe have made these containers for centuries – thus the cooking assumption. Potters used to congregate where clay deposits and transportation routes coincided to best accomplish their work. Early on in the US such communities were called “jugtowns.” Imagine a US map with a shot gun blast through it. That would be a jugtown map. They were scattered everywhere. Some big, many small. They began in places like Yorktown VA to Charleston MA and beyond. Some jugtowns got bigger and more organized as time went by and pottery technology evolved. Particularly in pottery neighborhoods of Bennington VT, Utica and Albany, NY, Portland, ME, Trenton, NJ, and elsewhere along the eastern seaboard. But all that was prologue. The big break out followed the westward migration across Indian lands. Gigantic jugtowns – factory towns really – sprouted up, pushed west by the railroads. East Liverpool, OH, Monmouth, IL, Redwing, MN. After Redwing, new jugtowns were unnecessary. By then railroads could deliver crockery just about anywhere. But something else was at play. Advances in glass, canning and refrigeration radically changed food preparation, storage and even menus. The need for things to put things in was forever altered. Big proved fatal. Pottery faded to irrelevance. The food industry certainly made pottery important. But food almost killed pottery as well. Interest in hand made pottery was just barely kept alive through China painting, the Arts and Crafts movement, and (later) even the GI Bill. But then Ray Kroc and his ilk whacked us with “fast food.” There’s little need for a plate or even a paper bag when eating a sandwich, burger or wrap. About all that’s left for potters today is the ‘moral high ground’ of aesthetics. This was evident even in the founding of “Jugtown” NC back in 1922. Nice, but not critical to most household budgets. Of course many modern potters can eloquently defend their existence. Still, without a clear idea of where we’re coming from how do we know where we’re going to? American Stonewares. Georgeanna Greer. Schiffer Publishing Ltd./Exton, PA. 1981. Raised in Clay, The Southern Pottery Tradition. Nancy Sweezy. Smithsonian Institution Press/Washington DC. 1984. Clay in the Hands of the Potter. Rochester Museum and Science Center. An exhibition of pottery manufacture in the Rochester and Genesee Valley Region c. 1793-1900. 1974. The Jug and Related Stoneware of Bennington. Cornelius Osgood. Charles Tuttle Co./Rutland, VT. 1971. The Pottery of Whately, Massachusetts. Leslie Keno. Historic Deerfield Summer Fellowship Program/Deerfield, MA. 1978. Turners and Burners. Terry Zug. University of North Carolina Prerss/Chapel Hill, NC. 1986. You are currently browsing the archives for the Early American ceramics category.